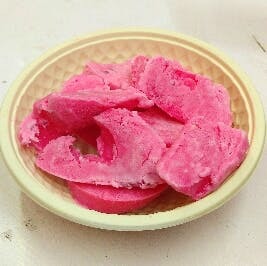 Try The Rose Kulfi From Kuremal Mohanlal Kulfiwale In Chawri Bazaar To Beat The Heat! Kuremal Mohanlal Kulfiwale, which is a much celebrated and "talk of the town" kulfi shop in Chawri Bazaar, made my day yesterday. Not for its otherwise famous mango kulfi and fruit kullads, but for its rose or gulab kulfi. Oh my! What an absolute foodgasm. I wondered why mangoes are so hyped in summer when you have great options with the refreshing, soothing and aromatic taste of rose as a base ingredient for Indian desserts. This is a must-have in summer if you literally want to beat the heat. A highly concentrated natural rose flavour and taste with just the right amount of sweetness and creaminess, this was enough for me to declare it the queen of kulfis this season. While you can enjoy other flavours with same delight, don't go without trying this one out. It's a guaranteed love affair with roses! You may not get all the flavours you like in a single visit. Take the metro till Chawri bazaar and follow Google Maps to the location, it's not a hard find. Also, people are sweet enough to direct you to the right lane. While you are at it, make some time and hop on a rickshaw to Bazaar Matia Mahal road-Jama Masjid and try the watermelon Roohafza sharbat from the street cart. Complete your dose of rose with this chilled, super easy on stomach and refreshingly soothing drink made with Roohafza, watermelon and melon seeds. The seller himself is so welcoming and cheerful that you wouldn't be able to leave without tasting some.